Our group projects are open to everyone connected with Weldmar, whether patient, carer or relative, as well as staff and volunteers. Our Creative Arts Practitioners encourage and support people to make contributions that are then collated into a book, film or display. An animation film made by people attending Weldmar Hospicecare’s Day Services. People who attend the day services are at a significant, and sometimes challenging, time in life, and opportunities to experience oneself as a person, not just a patient, are invaluable in maintaining a positive sense of identity. The arts team facilitates group programmes and has arts spaces in the day services. They provide a setting for people to share in each other’s experiences and creativity and this opportunity consistently proves to be an affirming experience. The team often runs organisation wide projects which enable people to work together towards one collective goal, and in 2017 this was an animation project. Animation is a medium that allows infinite story making possibilities. The making of an animation also offers participants in the project a wonderful range of ways in which to engage with it. We ran regular animation workshops at each of the five-day services Weldmar runs – in Dorchester, Weymouth, Sherborne, Blandford and Bridport. Participants were involved from the outset, initially with story boarding, and then illustrating images, assembling and animating the scenes and recording voice overs. We all very quickly became acquainted with how long it takes to create just one second of viewing! 29 patients, 5 family members, 9 volunteers and 8 members of staff were involved in making the animation. Participants felt strongly that they wanted to express their feelings to a wider audience about their experience of the hospice and what a positive role it has played in their lives. As it turned out this misconception of what a hospice is, was not the only one the project addressed. It could be easy to make the assumption that people attending a hospice would not have the capacity to come together to produce an animation. In fact people were brimming with ideas. But while some participants didn’t doubt their capacity, they did doubt their ability to grapple with digital technology. It turns out those people underestimated themselves. It seems we are surprising creatures. The animation expresses beautifully that the hospice can be a very lively place to be in and that even while living with a terminal illness people are able embrace and engage with each other and the modest yet expansive ideas that come their way. Group projects previously created include was the Grumpy People and their Seeds of Hope book, and a reminiscence book of people’s memorable clothes, hats and jewellery, called My Old Frock. In March 2013 was our Lanterns for spring project. During the first half of 2014, our Arts Therapists led a project called ‘What’s in the Box?’. The Arts Team talked to patients, carers and staff, recording their stories of special objects that they treasure, and taking photographs of them with their treasured object. 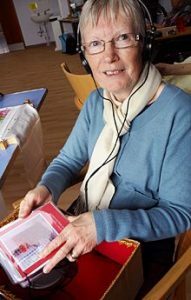 These photographs and recordings were placed in a ‘travelling shoebox’ to travel the length and breadth of Dorset so that patients at all of our sites, and in the community, could listen to peoples’ stories. Simply place the headphones on, press ‘play’, and sit back to enjoy 27 intimate, funny, sad, and fascinating stories. The photo shows patient Brenda Webster using the travelling shoebox at our Shaftesbury Wellbeing Centre at Westminster Memorial Hospital.